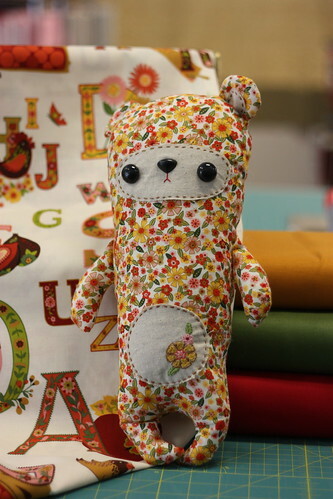 Melissa liked the simplicity of the Peg Bear project she would recommend it as a great starter project. 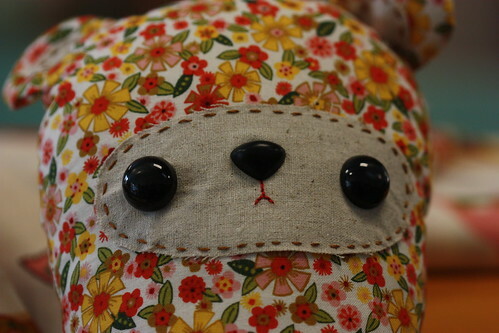 Following the instructions in the book the Peg Bear can be completed within 2 hours. 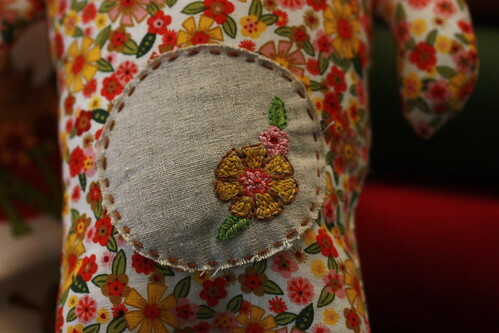 Melissa added a bit of time to her project by hand embroidering the belly and adding a running embroidery stitch around the face and heart on the bum (a special touch by Melissa). She was going to add a name in the heart, but her husband gave her the old, “less is more” lecture so she stopped there. A piece of fusible interfacing was added under the face to help hold in the eyes and nose, just for added support. Melissa used a safety nose instead of embroidery. One fabric – you can’t be serious! 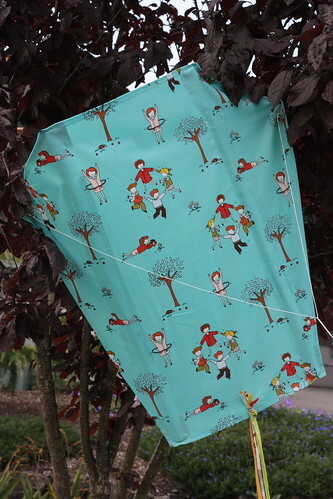 3 fabrics were used Moda Bella Solids in Scarlet and 2 – 5 inch charm squares of Sherbet Pips Play Dot Cherry. The pattern is a fun one and a half hour project. Start to finish. 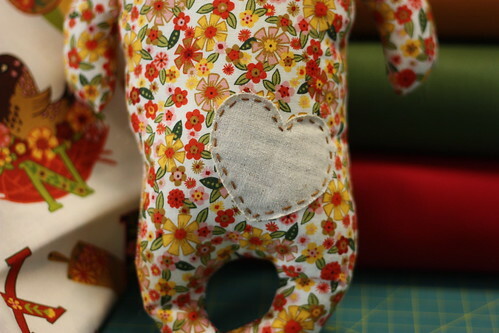 Note – Add 1/4 inch seam to each pattern piece as listed in the instructions beyond the cut list. 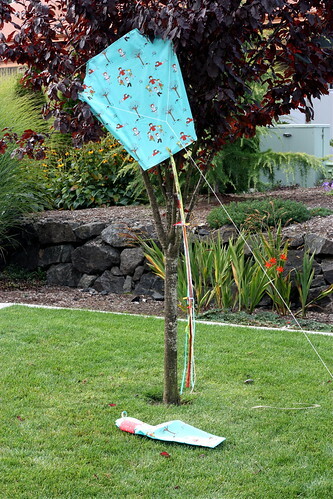 Step 2 – Edgestitch all edges of the kite – With wrong sides together Diana placed the top and bottom pockets along with the side reinforcements then stitched the hem on the kite. 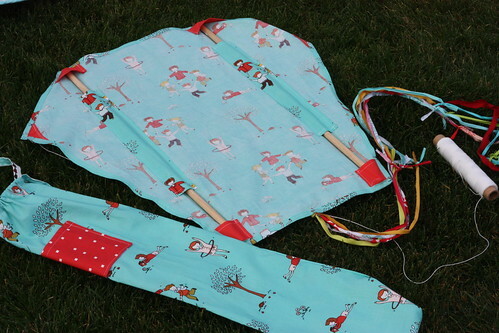 The rings for the harness were placed on the right side of the kite so the fabric will face you when in flight. The scrappy tail was made using pieces from the Pink Chalk stash. What a happy decoration for any child’s room! Did the kite fly? 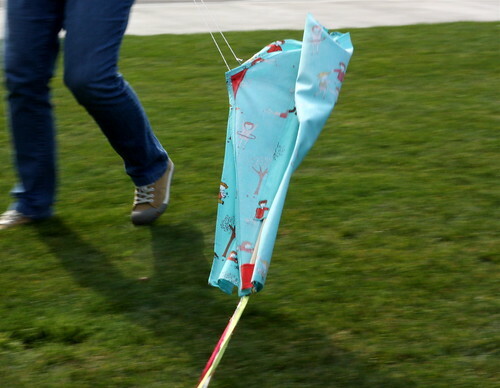 Well… we needed more wind or perhaps a child’s touch to test it properly.